2000-07-02. New. Ships with Tracking Number! INTERNATIONAL WORLDWIDE Shipping available. Buy with confidence, excellent customer service! Ivan R. Dee. PAPERBACK. 1566634156 New Condition. . New. Ivan R. Dee, 2000. Hardcover. New. 9.52 x 6.44 cm. Ivan R. Dee. Hardcover. 1566632897 New Condition *** Right Off the Shelf | Ships within 2 Business Days ~~~ Customer Service Is Our Top Priority! - Thank you for LOOKING :-) . New. 2000-07-02. Good. Ships with Tracking Number! INTERNATIONAL WORLDWIDE Shipping available. May not contain Access Codes or Supplements. May be ex-library. Shipping & Handling by region. Buy with confidence, excellent customer service! Ivan R. Dee. PAPERBACK. 1566634156 Like New Condition. . Fine. Ivan R. Dee. Hardcover. 1566632897 Special order direct from the distributor . New. Ivan R. Dee, 2000-02-08. Hardcover. Used:Good. Ivan R. Dee, 2001-12-17. Paperback. Used:Good. Ivan R. Dee. PAPERBACK. 1566634156 Special order direct from the distributor . New. Ivan R. Dee. Hardcover. 1566632897 *LIKE NEW* Ships Same Day or Next! . Fine. Ivan R. Dee. Hardcover. 1566632897 *BRAND NEW* Ships Same Day or Next! . New. Chicago: Ivan R. Dee. book and jacket are in very good condition. clean, tight, and square. no markings. little shelf wear. minimal soiling. may have never been read. . Very Good. Hardcover. 2000. Chicago: Ivan R. Dee, 2000. Book. Illus. by Cover by Steve Trapero. Near Fine. Soft cover. 1st Edition thus. 14572 shelf. Trade paperback, photo covers, black spine. No spine creases. No names, clean text. With a few b/w photos. Index. Solid..
Ivan R. Dee, 2000-02-08. Hardcover. Like New. 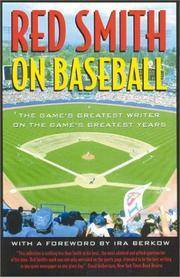 This book includes a signed note from Red Smith on NY Times stationary. Excellent condition. Interior is tight, bright and clean; no underlining, notes or highlighting. Hard covers are tight and stiff. Complete with original and sticker free paper dust cover. 100% Satisfaction Guaranteed. All items are carefully enclosed with bubble wrap. We ship promptly and worldwide via US Post and will email you a tracking number. Ivan R. Dee, 2000. Book. Very Good. Hardcover. Ivan R Dee, 2000-02-08. Hardcover. Good. Ivan R Dee, 2001-12-17. Paperback. Good. Excellent customer service. Prompt Customer Service. Ivan R. Dee. 2000. Paperback. UsedVeryGood. Paperback; light fading light shelf wear to the cover; remainder mark on th e bottom page edge; otherwise in very good condition with clean text and ti ght binding. .
Ivan R. Dee, Publisher. Used - Good. Former Library book. Shows some signs of wear, and may have some markings on the inside. Ivan R. Dee. Used - Very Good. Great condition for a used book! Minimal wear. Dee Publisher, Ivan R., 2001. Paperback. Good. Disclaimer:A copy that has been read, but remains in clean condition. All pages are intact, and the cover is intact. The spine may show signs of wear. Pages can include limited notes and highlighting, and the copy can include previous owner inscriptions. At ThriftBooks, our motto is: Read More, Spend Less.Dust jacket quality is not guaranteed. Dee Publisher, Ivan R., 2001. Paperback. As New. Disclaimer:An apparently unread copy in perfect condition. Dust cover is intact; pages are clean and are not marred by notes or folds of any kind. At ThriftBooks, our motto is: Read More, Spend Less.Dust jacket quality is not guaranteed. Dee Publisher, Ivan R., 2000. Hardcover. Very Good. Disclaimer:A copy that has been read, but remains in excellent condition. Pages are intact and are not marred by notes or highlighting, but may contain a neat previous owner name. The spine remains undamaged. At ThriftBooks, our motto is: Read More, Spend Less.Dust jacket quality is not guaranteed. Dee Publisher, Ivan R., 2000. Hardcover. Good. Disclaimer:A copy that has been read, but remains in clean condition. All pages are intact, and the cover is intact. The spine may show signs of wear. Pages can include limited notes and highlighting, and the copy can include previous owner inscriptions. An ex-library book and may have standard library stamps and/or stickers. At ThriftBooks, our motto is: Read More, Spend Less.Dust jacket quality is not guaranteed. Dee Publisher, Ivan R., 2000. Hardcover. Good. Disclaimer:A copy that has been read, but remains in clean condition. All pages are intact, and the cover is intact. The spine may show signs of wear. Pages can include limited notes and highlighting, and the copy can include previous owner inscriptions. At ThriftBooks, our motto is: Read More, Spend Less.Dust jacket quality is not guaranteed. Dee Publisher, Ivan R., 2000. Hardcover. Good. Disclaimer:A copy that has been read, but remains in clean condition. All pages are intact, and the cover is intact. The spine may show signs of wear. Pages can include limited notes and highlighting, and the copy can include previous owner inscriptions. The dust jacket is missing. At ThriftBooks, our motto is: Read More, Spend Less. Ivan R. Dee, Publisher. Used - Very Good. Ships from the UK. Former Library book. Great condition for a used book! Minimal wear. 100% Money Back Guarantee. Your purchase also supports literacy charities. Ivan R. Dee. Hardcover. 1566632897 Great used condition. A portion of your purchase of this book will be donated to non-profit organizations. Over 1,000,000 satisfied customers since 1997! We ship daily M-F. Choose expedited shipping (if available) for much faster delivery. Delivery confirmation on all US orders. . Very Good. 2000-02-08. Ivan R. Dee. Hardcover. GOOD. Spine creases, wear to binding and pages from reading. May contain limited notes, underlining or highlighting that does affect the text. Possible ex library copy, thatâll have the markings and stickers associated from the library. Accessories such as CD, codes, toys, may not be included. Ivan R. Dee. Paperback. GOOD. Spine creases, wear to binding and pages from reading. May contain limited notes, underlining or highlighting that does affect the text. Possible ex library copy, thatâll have the markings and stickers associated from the library. Accessories such as CD, codes, toys, may not be included.